There is a downside to situational awareness. I discovered this fact while 868 miles north of the Arctic circle, 600 miles south of the North Pole. 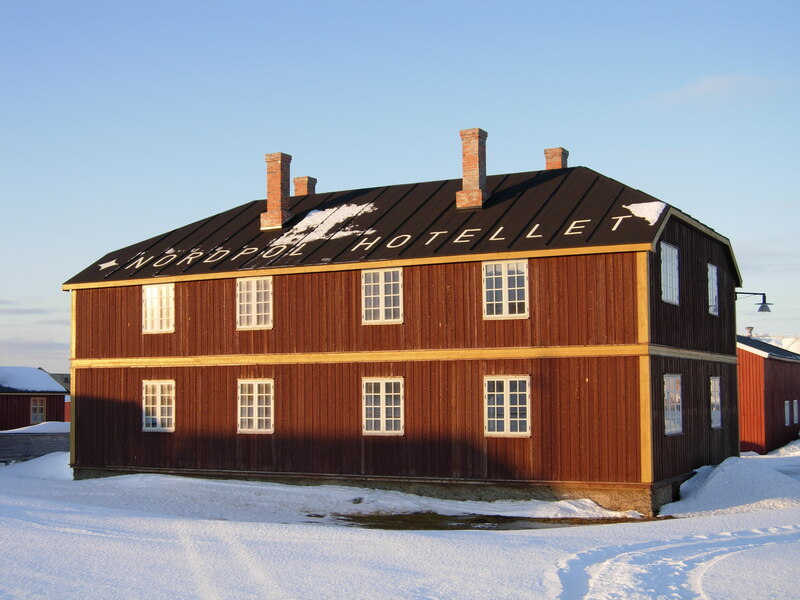 It took place in Ny-Ålesund, Svalbard, a part of the well-known island Spitsbergen. I was helping the Smithsonian Institution train divers in polar diving. My job was to teach them about scuba regulator performance in frigid water. A fact of life in Ny-Ålesund, the most northern continuously occupied settlement, a research village, is that Polar Bears are always a threat. In fact, one came through town during our visit to Svalbard. The Greenland sled dogs, tied down outside, were understandably, and quite noisily, upset. The bear walked right past them. After the excitement of that nighttime polar bear prowl had begun to wane, the incident remained as a not so subtle reminder during seemingly routine activities. For you see, polar bears are emotionless killers; to them, we are prey. Tracking and eating a human gives it no more pause than us picking blackberries alongside the road. For adult polar bears, humans are simply a conveniently-sized food item, not nearly so fast and wily as their typically more available meals, seals. Unlike the ploy of divers bumping potentially predatory sharks on the nose to dissuade them from biting, bumps on the nose don’t work with polar bears. Without a gun by your side, a walk in Svalbard is a walk on the wild side, and not in a good way. I was observing and photographing boat-based diving operations from the end of a long pier jutting 375 feet (115 m) into the Kongsfjorden. Normally in March the fjord is ice covered, but the year I was there (2007) there was no ice to be seen except at the nearby glacier. I had been standing at the pier’s end for a while taking photographs, and soaking up the polar ambiance, when I looked back and realized that from a safety standpoint, I was vulnerable. That is when situational awareness began to kick in. We were in a deserted, industrial portion of the town. The old coal mining operations were shut down long ago. Other than the divers on and in the water, I was the only one around. And I was stuck out on the end of a very long pier, with no means of escape. If an intruding and hungry bear made its appearance at the land side of the pier, I would be trapped. Although I was dressed for cold, I was not dressed for cold water. That water was, after all, ice water. Polar bears, on the other hand, are excellent swimmers in polar water. So after I’d jumped into the water, which I would have if faced with no alternative, it would have taken the bear only a few furry strokes before he would have me. While he or she would find my body parts chilled on the outside, my internals would still be pleasantly warm as they slid down its gullet. Being a sensible person, I called the boat drivers over and put them on alert; should a polar bear appear at the far, land-side end of the pier, they should pick me up post haste. Otherwise, there would be no way I could safely escape from my vulnerable position. No photograph is worth dying for. Being nice fellows, they agreed they would keep an ear out for my shouts. They then returned to their duty of waiting for and recovering the divers. As the boat eventually sped off with its load of thoroughly chilled divers, I realized that I had been deluding myself all along. At their distance and with the noisy interference of the boat motor, my shouts would have been inaudible. And from their low position on the water, they would have been unable to see what I was so agitated about; until it was too late. My return back to the safety of the diving center was a cautious one; with the full realization that I was exposed and vulnerable for the entire route. Fortunately, safety was only a third of a mile away, but that was a long 500 meters, which gave my alert mind plenty of time to focus on walking quietly, and avoiding being eaten. Nothing focuses the mind like knowing that close by, hidden by piles of snow, could be lurking a camouflaged predator looking for lunch. This Youtube video shows a Polar Bear searching for food in Ny-Ålesund during the brief Arctic summer. 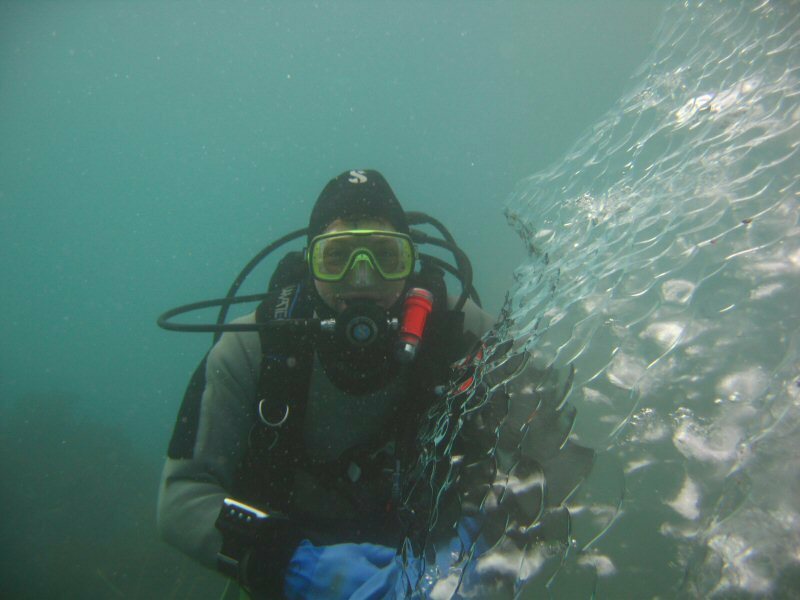 In 2007 Michael Lang of the Smithsonian Institution’s Scientific Diving Program sponsored a spring-time ice diving course in the high Arctic at Ny-Ålesund, Svalbard, in an area generally called Spitzbergen. Ny-Ålesund, an international Arctic research town situated at 78°56’N, 11°56’E, is the most northern continuously operated community. It sits on the shore of a fjord called Kongsfjorden. In the springtime, the sea ice on the Kongsfjorden is usually several feet thick, providing an inviting platform for ice-diving operations. However, during the last decade the sea ice has been becoming thinner and sparser. By the time we arrived, there was virtually no ice on the fjord. The closest ice source was a glacier over two miles away. With no ice, polar bears could not capture their ringed seal prey, and were thus hungry, leading undoubtedly to the polar bear encounter described in an earlier posting (April 12). It also left the course instructors, and I was once of them, in a quandary. It was expensive transporting diving scientists to the high Arctic to learn ice diving operations, and there was no ice to be seen. 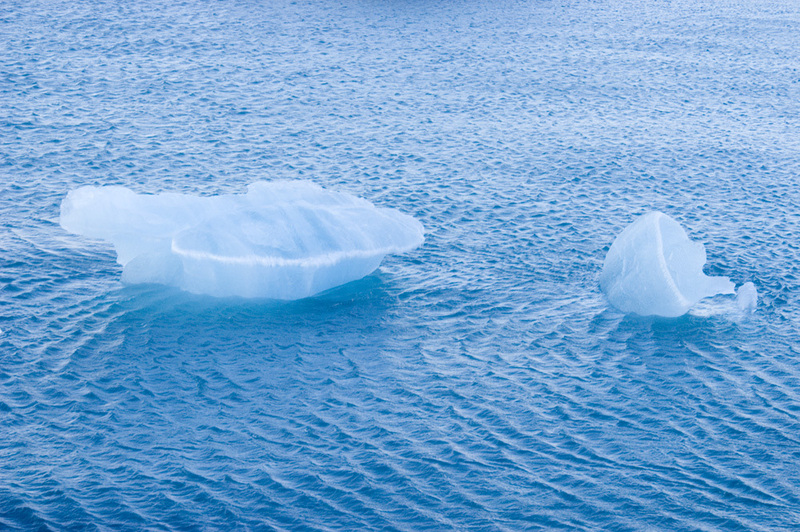 It appeared to us that the Arctic really was melting, surprisingly early in this case. Although we had a few frigid days during our week-long stay, frigid enough to remind us we were close to the North Pole, one memorable day was almost balmy, reaching 0° C (32° F). Looking out over the fjord I saw mini-icebergs, recently calved by the rapidly melting glacier a few miles away. The word went out to launch all divers. Dry land and underwater cameras, and high-definition video were working overtime to record the encounters between divers and ice. The result was some striking photos of delicately scalloped floating ice, with divers getting into the frames — just to prove they were indeed “ice-divers.” Unfortunately, that was not the type of experience that had been planned for those scientists. As you might imagine, the water in the fjord was still bitterly cold, so the part of the course designed to teach about human and equipment survival in cold water was fully accomplished. However, due to the growing sparseness and unreliability of the Arctic sea ice cover, the Smithsonian Diving Program has now moved its training and testing operations to McMurdo Station, Antarctica (see April 11 and May 26th posting). There, at least for the time being, lies plenty of thick sea ice covering the Ross Sea during the austral springtime. 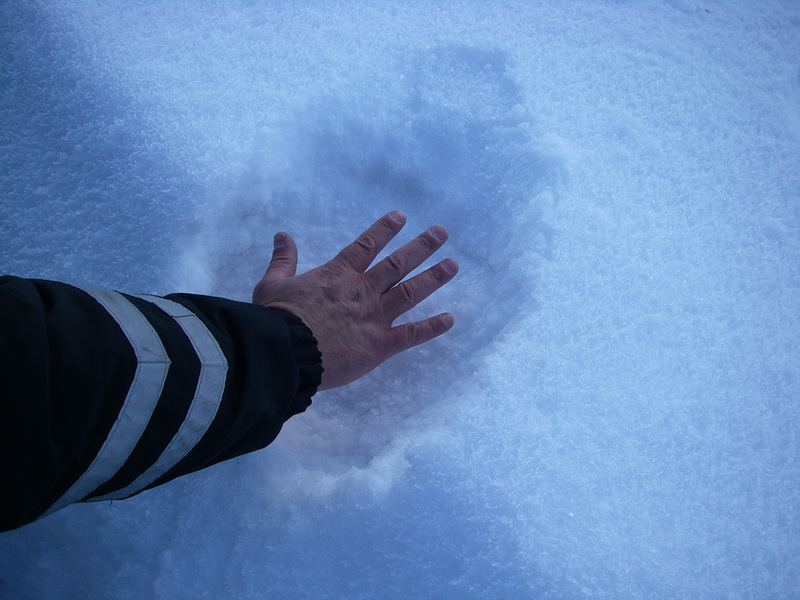 I had not been impressed by the global warming rhetoric before I traveled to the Arctic. However, having seen the consequences first hand, at least in the far North, I get the strong impression that there are undeniable local climate changes occurring. Whether it is a truly global change, and whether man is somehow responsible, is an area of speculation that I will not venture into. In some places, the food chain gets down-right personal. In the high Arctic, a careless human is not a top predator; he is a meal. Polar Bears are methodical hunters, showing no fear of humans. When hungry, they are white death on paws. 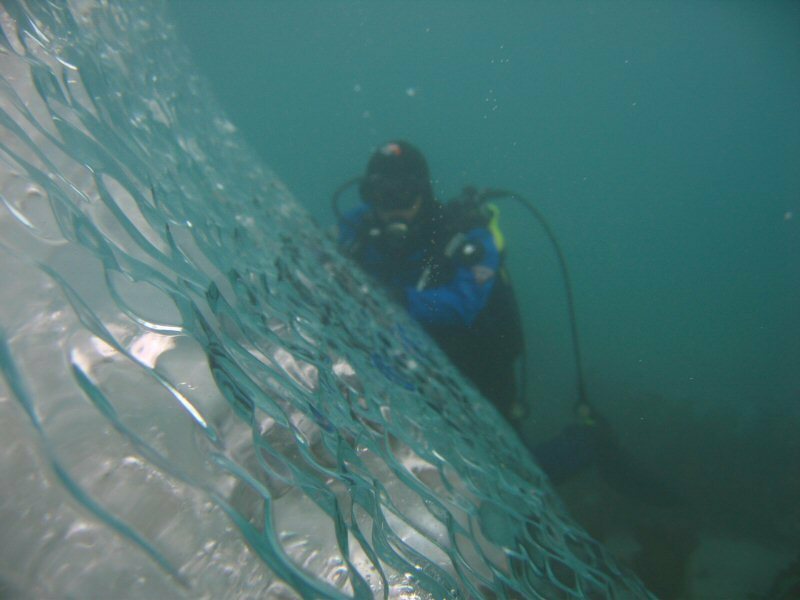 In 2007 the U.S. Navy and I were helping the Smithsonian Institution Scientific Diving Program teach a course on under-ice diving in Ny-Alesund, Svalbard, an international research town a relatively short distance from the North Pole. Ny-Alesund is the most-northern continuously occupied settlement, and is occupied year-round by scientists and support personnel. The fjord adjacent to Ny-Alesund is normally covered in 4-5 feet of sea ice in the springtime, making it an ideal location for training in under-ice diving. To gain access to the water, ringed seals travel some distance from land to find holes penetrating the ice, through which they enter and exit the water beneath the ice. And polar bears walk out on the ice to patiently wait for the seals to reappear, and be gobbled up. In 2007, the sea ice was gone. 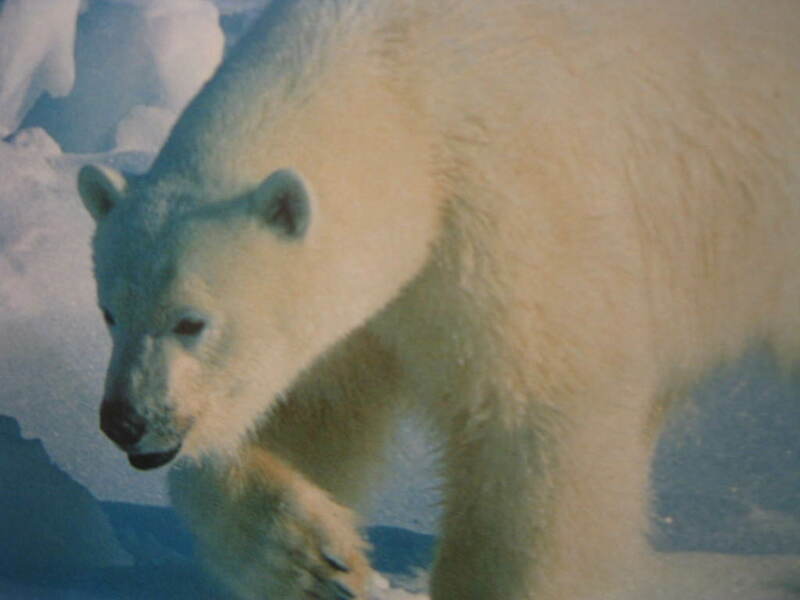 The polar bears’ food was not concentrated around breathing holes, and thus the bears were not catching many seals. They were hungry. By law, the resident and visiting scientists had to carry rifles with them when they ventured away from the icy town to do research in the surrounding hills. But in town, no weapons were required. Polar Bears simply didn’t come into town. There is only one bar in Ny-Alesund, and it specialized in serving Jesus Drinks during parties. A Jesus Drink is any alcoholic mixture served with glacial ice that is roughly two thousand years old. Get it? The bear was headed towards the area where about a dozen Greenland Huskies, used for pulling sleds, were tied down for the night. So the deathly calm of the Arctic night was shattered by a female doctor yelling at the top of her lungs, while the vulnerable dogs were barking to save their lives — literally. Of course I hopped out of bed, threw on my multiple layers of Long Johns, slipped into my Arctic parka and gloves and headed out the door to see the bear. As luck would have it, our experienced dive team leader from the Smithsonian was walking in as I was headed out. “Hmm… I see what you mean.” I hadn’t looked at it from the perspective of a hungry bear. I turned around and went back to bed. The next morning we found bear tracks a plenty. The dogs had scared off the bear apparently, since he didn’t claim any animals. Lucky dogs. happened to have a party, with plenty of glowing blue Jesus ice. 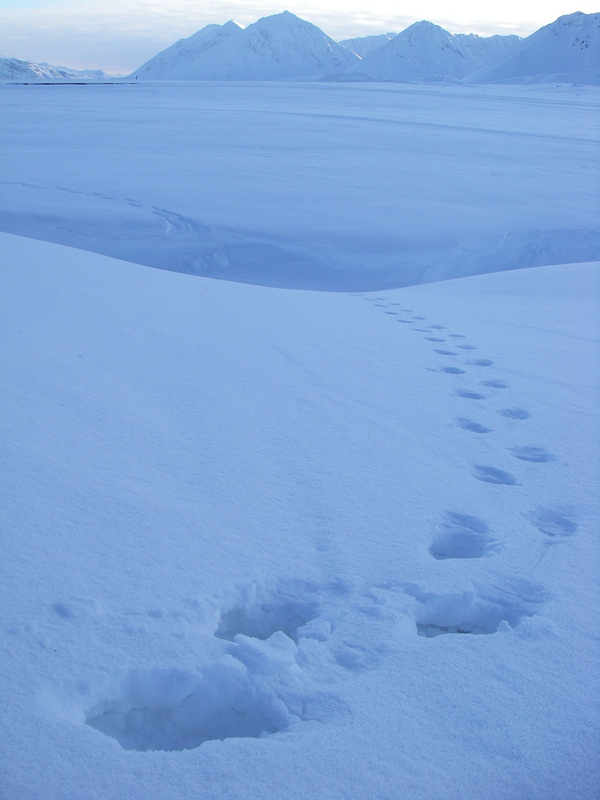 Although the walk to the bar, down a snowy road with no protection from the elements had not seemed daunting in the fading polar daylight, things were different when I returned to the dorm about midnight, by myself. There was no moon so the sky was pitch black, but everything else was white, except for me. My parka was brown, and in retrospect made me look a bit like a muffin. And of course I knew that out there in the whiteness, somewhere, was a brazen, hungry bear looking for a snack. I had never thought of myself as a potential meal, until then. My head was on a swivel, and my not-yet dark adapted eyes were peering towards the most distant snow and ice, in all directions, looking for a movement that might warn me of a bear. And then the huskies started yelping again, in obvious alarm. That was when I realized that by the time I saw the white on white predator, he would have me. They’re fast, and I had nowhere to run for safety. I was in the open. That is a curious feeling, knowing that you could be taken like a hunter takes a deer. I wondered how badly it would hurt. Well, with that Jesus ice coursing through my veins, I felt safe. That is, I felt safe once I was back in the dorm, snug in my bed. As I lay there trying to fall asleep, I couldn’t help but reflect on how primal a fear it is, that fear of being eaten.